This is one of the new releases of novelty products for 2011 from Carlton Ware . 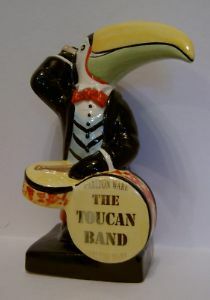 This one is from The Toucan Band ensemble - The Drummer. He is wearing a black jacket with red trousers. He has a blue v-striped with black waistcoat and a red bowtie. His beak is yellow on top and light green beneath. The drum has a red mottled surround. He stands about 7 inches (18 cms) tall. It is backstamped appropriately also showing it also to be number 1 out of a limited edition of only 10 pieces.